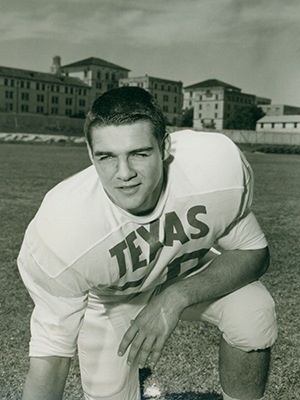 David McWilliams, BA ‘64, Life Member, is associate athletics director and head of the T Association, the organization of UT letterwinners. 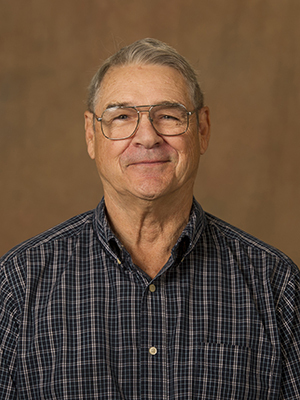 He served as head coach of the Texas Longhorns football team between 1987-91, and was co-captain of the national champion 1963 Texas Longhorns. Andrew Roush: This year is the 50th anniversary of that first national championship, and you’re the perfect guy to talk to. 1963 was a very eventful year for UT and for Texas. I believe the Board of Regents voted to integrate the University that fall, President Kennedy was killed in Dallas that fall, and that was also our first national championship under Coach Royal. Take me back to ‘63. What was it like to live through it? David McWilliams: I’ve always said that I think ‘63 was a result that started really back in 1960 with the recruiting class that Coach Royal the coaches brought in. Most of us played as sophomores as the ‘61 team, and probably the ‘61 team had the most talent of the three teams. We scored a lot of points and we played good defense and we lost to TCU six to nothing in ‘61. The next to last game and that knocked us out of number one. Then in ‘62 we’re going along number one again and we tie Rice and Houston, and that knocks us out of number one. So we started spring training and getting ready for ‘63 with the resolve that we just weren’t going to let that happen. Also that year was the year that the boy had the heat stroke and died. Reggie Grove, in two-a-days. No one got water then, and unfortunately there were at least two players, Reggie Grove at Texas and Mike Kelso at SMU, that had heat strokes that same week and never came out of it. That’s when they thought maybe we’re not doing this right. That was a big change in ‘63—they started giving you a little bit of water, not much, but a little bit. AR: If there was a defining characteristic of that 1963 team, what would it be? DM: I think the closeness of the team. 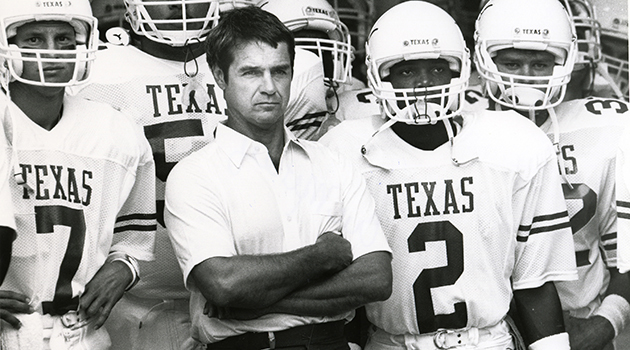 Mack Brown talks about one heartbeat, and I think that we all had that one heartbeat. It’s really funny; back then, it’s probably easier. You couldn’t gripe at the offense because you were the offense, couldn’t gripe at the defense, couldn’t gripe at the kicking team … You didn’t have a whole lot to gripe about. AR: How much of that season’s success had to do with Coach Royal? DM: I think Coach Royal always tried to underplay the strength of our team. He would tell us, ‘What I tell the media is not necessarily what I believe about you all. I don’t want this on the book of all of our opponents.’ He would tell us that he was going to try and underplay it. He did not worry about trying to get the Eastern [sports]writers to bill us as one of the top football teams in the nation. He didn’t even do that in the Southern states. AR: He was happy to sneak up on people. AR: You talked about the reputation of the team and how that Navy game was the nail in the coffin to show the world that you had what it took. Was that the turning point in the season? DM: I think when we beat Oklahoma pretty soundly in the Cotton Bowl and took over number one, our feeling was ‘alright, we’re there.’ We knew that we had to beat Oklahoma or our whole chance for the year would be gone right there. There was a feeling—and this was really the players talking not so much the coaches—’we’re there now, alright remember TCU and remember Rice and prepare every week.’ I think that was the turning point; we talked the whole time before the OU game like this is our opportunity to take over the number one spot. We’ve got to secure—you know we played Arkansas next week. We thought we got it in our bag now, we just got to hold on to it. AR: Tell me about that moment when the Navy game was over and you knew you were national champions. She loved football. She loved academics, but she loved football. So actually prior to the game, we had a team meeting. I couldn’t really talk. I said, ‘Well my mother’s going to have the best seat in the house.’ So for me my first reaction was how proud my mother was of our team. My first feeling was just so happy. AR: You’ve had a very long relationship with this University. Why are you still dedicating your time to UT? DM: Having been a Texas Cowboy—I love the Cowboys and Spurs—they say ‘give your best to Texas and it will give the best to you.’ And I think that’s so true because Texas has been so good to me. I just have a good job, and it’s hard to leave something that you enjoy and they have been very nice to me and I want to give back so long as I am strong and can. I guess when I feel like I’m tired and don’t have that fire for the Longhorns, that’s when I’ll set it down and go fishing.